Native American Folk Art - WHAT IS NATIVE FOLK ART?Native Folk art is characterized as artwork by untrained, self-taught artists and the artwork is non-utilitarian, highly personal, even idiosyncratic. The craft may be derived from communal traditions. Something personal must be added to qualify it as art. In other words, the craft may be learned but it is self-taught. Native Folk art is characterized as artwork by untrained, self-taught artists and the artwork is non-utilitarian, highly personal, even idiosyncratic. 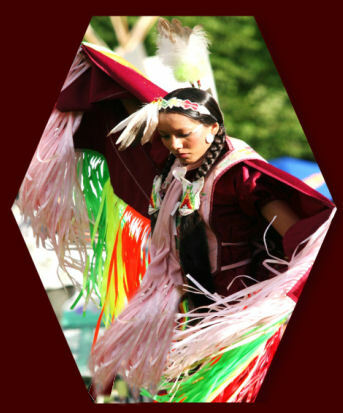 The craft may be derived from communal traditions. Something personal must be added to qualify it as art. In other words, the craft may be learned but it is self-taught. Some artists, traders, and collectors feel this definition is overly and needlessly restrictive, and a close look at its presumptions makes it easy to see why. First, the distinction between craft/learned and art/self-taught is difficult to uphold in practice. The cases of families of artists such as the Willetos are illustrative. 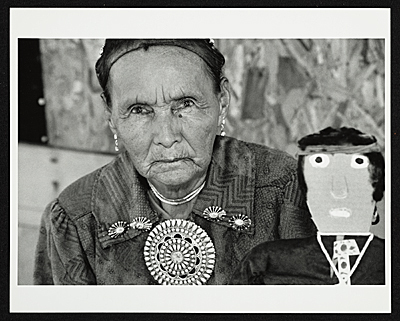 The late Charlie Willeto is believed to be the Navajo tribe’s most famous folk artist. His small sculptures include human and anthropomorphic figures with arms upraised and bent at the elbows, and owls, many with moustaches. Willeto’s works are painted using motifs from Navajo rugs and sandpainting, as well as rock art and many wear Navajo jewelry. His wife, Elizabeth Ignacio and sons Harold and Robin, also carve. The subject matter of their carvings, their figures’ stances, and elements of their painting are both idiosyncratic and yet clearly reminiscent of Charlie’s work. Folk art has a sense of commentary—sometimes biting, sometimes playful. Delphine Warren’s grinning George W. Bush dwarfs a decidedly unsmiling Navajo woman at his side . 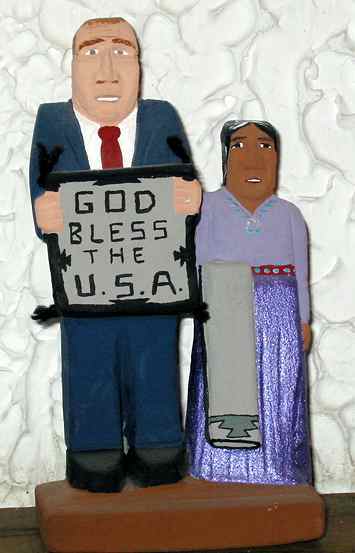 In this sandstone carving, Bush is holding up a Navajo weaving that reads “GOD BLESS THE USA” and appears to be trying to elbow the woman out of the frame. 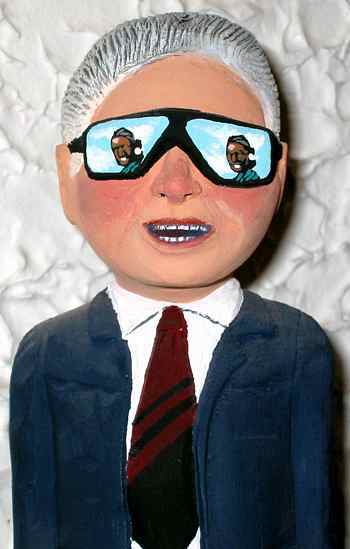 Above is Harrison Juan’s wood carving of Bill Clinton with a Navajo clearly reflected in his sun glasses. These pieces are literally “world making”: they re-create and represent contexts ranging from the geocosmological to the vernacular worlds of everyday life. The work itself is often small. It does not typically participate in a rhetoric of the monumental where size, in and of itself, matters. Indeed, the small scale of much of this work focuses the viewer’s attention on details, even in pieces with comparatively simple lines. This focus encourages a particular kind of close reading; viewers might read the actual details of a piece (color, shape, design), the details (spots, nicks, splits) in the material, and the intersection of both. These details may also speak of artists’ personal or cultural fantasies and projections. 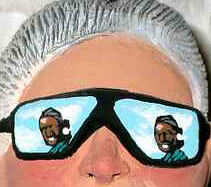 Others see the practical in folk art. 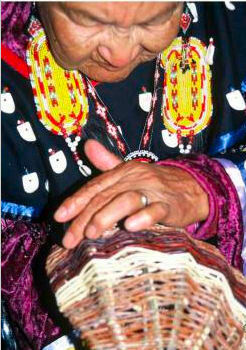 Like most other artists, native or not, create beautiful art in order to eat and live. Charlie Willeto, for example, carved and traded his work for food at a Lybrook, New Mexico, trading post. This is not purely an historical phenomenon. For the majority of Navajo artists I have interviewed, folk art production is income production as much as self-expression. In some cases, it generates off-the-books income to supplement assistance payments. For others, like Mamie Deschillie (famous for her cardboard cutouts of fluffy sheep and other creatures, all adorned with sequins and bits of fabric, eyelashes and earrings), folk art puts children and grandchildren through college. 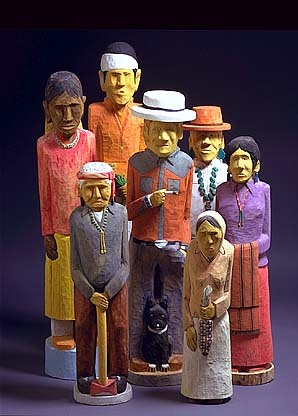 Navajo Folk Art is animated, sometimes appearing as autonomous figures endowed with a life of their own. The Navajo people are not only extremely artist and creative, they also have a great sense of humor. 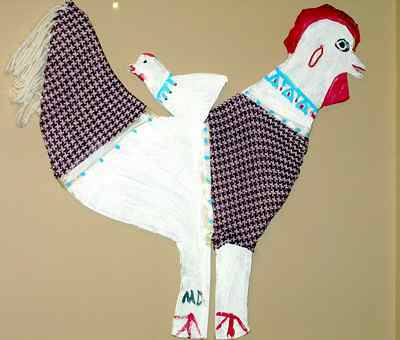 This comes across in their folk art. Pictorial rugs, carvings, pottery, baskets, and paintings are considered “folk art” if they fit within, or expand, the existing range of objects already included in the category. “Navajo folk art” describes a set of relationships between people, objects, and history—not the biographies of individual artists or the properties of the objects themselves. Though the properties of Navajo folk art cannot be sufficiently generalized to serve as a prescriptive definition for all native folk art, the objects in question do share some similar characteristics. These include an economy of form; thematic or ironic references to Navajo traditions and/or everyday life; and often include humor. Copyright 2013 Native American Folk Art. All rights reserved.